In windows as in clothing, dressing in layers to trap insulating air works quite well. Newer windows accomplish this by having air or gas sealed between double- or triple-panes, and having those panes sealed into insulated frames. Old windows like this one are in essence wearing long johns, warm clothes, a sweater, and a jacket. The layers, from the inside out, are a roller shade, sheer curtains, a casement window with six panes, and a storm window with four panes. The most effective part of that is the air trapped between inner and outer windows. Perhaps the red paint on the brick wall is an attempt to warm up the situation. The icicles on the shrub aren't encouraging. Nevertheless one can hope for many summer days with the sheers billowing out the open casements, and a pot of pink petunias blooming merrily on the window sill. 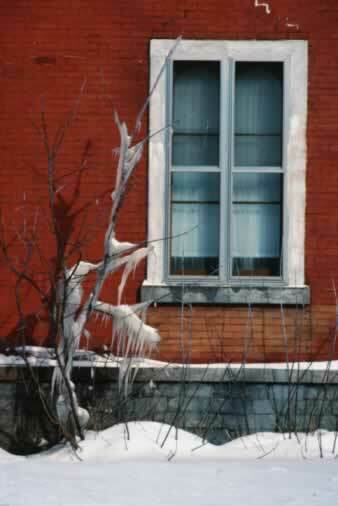 Home > Windows > Window Types > Storm Windows > Window Takes to Heart "Dress in Layers"